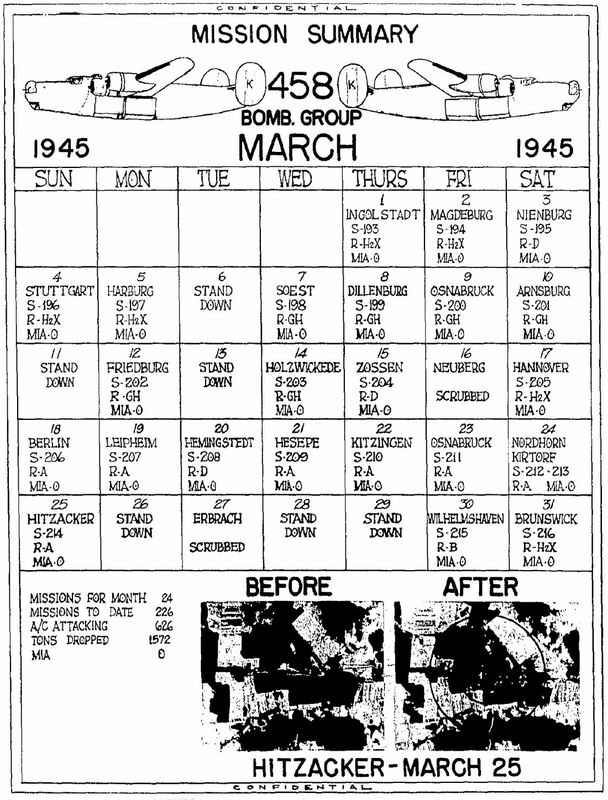 The most outstanding phase of our efforts for the month of March was the excellent record of bombing while being fortunate to enjoy ten visual runs with seven of them resulting in excellent scores, one very good and two poor. This has been the first month in ages that we have been able to see and bomb so many targets visually. Month after month, we had been bombing using instrument technique, but this month we were able to see in black and white the fruits of our training, sweat and toil. There is no doubt that the morale of not only the combat personnel, but the ground staff as well, shot up to a new high with the gratifying results obtained on these visual runs during the month. There is something about visual bombing that grip the crewmen. They must say to themselves, “Here we have been, flying above the clouds so many missions without a glimpse of Mother Earth that it has been monotonous, and now by gosh, we can show them what we are able to accomplish when the weather is with us.” Then too, we imagine the results obtained by visual bombing must mean a personal triumph of the pilot, co-pilot, navigator and bombardier, knowing in their minds that these results will prove that our brains are much sharper than any H2X or GH set yet invented. Not only were we able to rack up 24 missions during the 31 days, but each mission saw our A/C go out to bomb the enemy and return without a loss of a single A/C or personnel. To add honey to this safety record, not one man was lost through accident or personnel error. This has been the first month of our operational period that we are able to boast of such a record. As an afterthought on this item, readers of this history will have to remember that with such a record, our MIA section usually appended to this history will naturally not appear this month. Another notable item which must be mentioned before we start our operational narrative is that our Commanding Officer, Col James H. Isbell, who has led us from our final phase training through our 200 missions (incidentally, the first CO of a bomb group to achieve this record) was ordered back to the States for a well-earned rest. 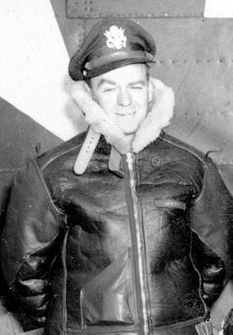 Col Allen F. Herzberg was appointed Station Commander under Par 1, SO 89, 2nd Air Division dated 10 March 1945. A biographical sketch of our new commander is appended. A M/Y, namely INGOLSTADT, was to be our first assigned target for the month. This was a secondary target which was to be bombed by H2X in the event the primary, the ME FACTORY at BAUMENHEIM was obscured by cloud. And, of course, the weather was against us, so our formation of 27 A/C were over INGOLSTADT led by MAJOR BETZOLD and LTS CHIMPLES and EISERT, dropping 168x500 RDX plus 94 M-17’s with H2X equipment with unobserved results. It was brought out at the critique that the lead H2X operator reported that he had a very good run. SORTIE 203 went up on the scoreboard. Our mission of 2 March called for an attack on the KRUPP AMMUNITION WORKS at MAGDEBURG. Plans called for either a [bombing run] by visual or H2X methods. This plant was producing tanks and is a top priority target in that category. Although it had been damaged in the past, all repairs had been made and it was up to us to put this important war plant out of the running. We placed 33 A/C in the air led by LT COL O’NEILL, and CAPTS QUINN, GARDNER and BRECKENRIDGE. 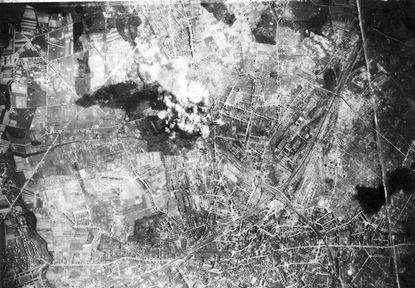 A total of 354x500 GP’s were dropped by instrument technique with poor results: photo coverage indicates lead squadron hit 14,000 feet SE of MPI – second and third squadrons hit in center point of city and just short of the river – fourth squadron’s bombs fell in open fields short of city. It was brought out at the critique that there was a terrific ground speed on the bomb run. The H2X operator picked up the target all right. The weather scout advised that a visual assist might be obtained. There was a hole in the clouds over the target, but it was not large enough to permit the bombardiers to synchronize. At the last possible moment before Bombs Away, the lead bombardier did pick up a visual checkpoint. However, it was too late to permit complete correction. A 10 degree correction to the left was made, but cloud and haze obscured the MPI. Just another day battling old man weather. Still on an uninterrupted streak of flying, we were again airborne on the 3rd having as our target for the day, the RR BRIDGE at NIENBURG. Our attack today would be carrying out the program to interdict the RHUR by cutting the main and secondary lines leading into it. Twenty-eight A/C led by MAJOR BOOTH, LTS BOWER and ALLEN were over the target. Carrying 1000 [pound] GP’s and with instructions to bomb visually only, we had to pray for clear weather over the target, but here is how the actual attack went. On the first run the lead bombardier had the target in his sights, but clouds closed in. No squadrons dropped. On the second run haze obscured target somewhat, but the 2nd and 3rd squadrons dropped with most hits being long. Another attempt was made, again to find the target completely obscured, so we then went to the rally point and took up the briefed bomb run on the secondary H2X target, BIELEFELD M/Y which was attacked by the lead squadron. No strike photos were available on this run. A total of 160x1000 GP’s were dropped on this, our 205th mission. We were up again on the 4th with the JET PROPELLED A/C at KITZINGEN as our assigned target. MAJOR BETZOLD, and LTS BOWERS and MITCHELL had the honor of leading the group. Twenty-seven A/C received sortie credit on this mission. It was an early take off but the marshaling and assembly went along OK. Just west of the Rhine River we passed through a front, then after a clearing the clouds built up east of the Rhine. It was cirrus with dense persistent contrails. The wing leader suggested the M/Y at STUTTGART [left] as a target of opportunity, so 24 A/C dropped on the M/Y by H2X methods with unobserved results. Two other A/C bombed with other groups with unobserved results. It was rather nice to be commended by the weather scout, that our wing was the only one that had anything like a wing formation. We feel sure that the bomb load of 152x500 RDX and 99 M-17’s materially assisted in the destruction of the target as the lead “Mickey” operators agreed that we had a well-coordinated run. The scope photos showed our bombs to be dropping right on the assigned MPI. On the 5th our old friend the OIL REFINERY at HARBURG was to receive another visit from the 458th. Although severely damaged on other raids, repairs were well under way and it was thought that the refinery [was] to be on the point of reactivation. On this day, the 458th went out alone thus making us the only group in the wing to be operational. MAJOR BREEDING was our Command Pilot leading the formation assisted by CAPTS GARDNER and BRECKENRIDGE. On the route in we ran into towering cloud banks that at one point reached up to 28,000 feet, but by excellent airmanship the group managed to stay together and drop 323x500 RDX bombs on the target through H2X equipment. Although results were unobserved, our H2X operator had a good run with his set giving good results, and the scope photos show us right over the MPI. We garnered 29 A/C sorties and our record of missions flown now reads 207. After a day of inactivity as far as operational flying went, we took off again on the 7th to attack the M/Y at SOEST, GERMANY. Although only a medium sized M/Y, it was reported to be extremely active and an important link to and from the Ruhr. Twenty-eight A/C were over the target led by MAJOR PHILLIP, CAPT BLUM and LT ALLEN, dropping 532x250 GP’s and 36 M-17’s with unobserved results due to existing 10/10ths cloud coverage. All three squadrons had good runs and good bomb releases. One of these days we are going to get a good visual run, then we will have something to write about. Mission 209 on 8 March called for an attack on the M/Y at DILLENBURG which had never been attacked before and is an important link for traffic going to the front lines. 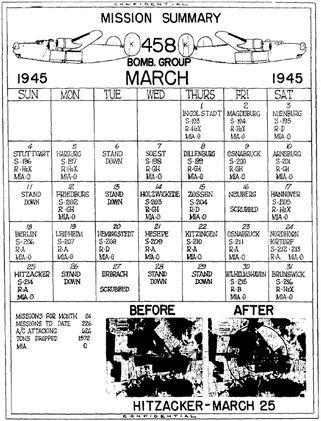 Although we were allowed 31 A/C credit sorties for the day, weather prevented a visual attack on DILLENBURG, and while on the bomb run a squadron from another group flew directly under us so we could not drop. 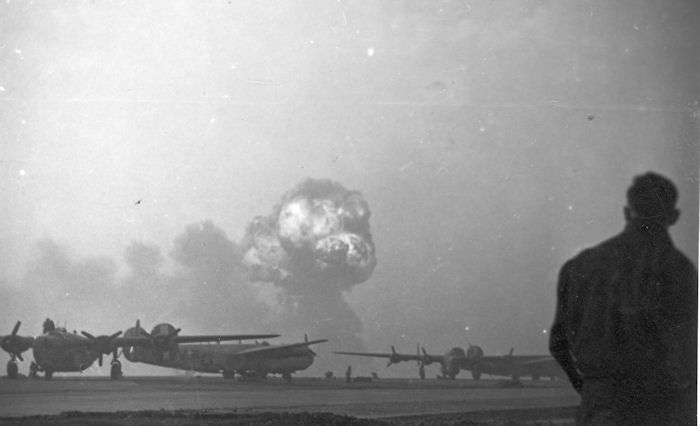 However, 3 A/C flew with another group and bombed DILLENBURG by GH whilst nine others dropped bombs ¾ miles SW of AHLBACH. Another day when weather plus personnel error by another group spoiled our results for the day. Returning to our attack on the Hun’s communication lines, we placed three 9-ship squadrons in the air on the 9th to attack the important M/Y at OSNABRUCK. We could clearly see the trend of heavy bombardment changing from strategic to tactical, and for us that meant but one thing: the closing chapters of the European war. The Hun had his back to the wall, and it was up to us to show the world that the successful role we played in strategic bombing could also be duplicated in tactical bombing. LT COL HOGG, CAPTS BLACK and GARDNER led our formation of 28 A/C over OSNABRUCK, dropping 1096x100 GP’s and 48 M-17’s by GH technique with a visual assist. SAV show bomb hits from 2400 to 7800 feet SSE of briefed MPI. There were plenty of cloud patches on the bomb run and about 5/10ths in the target area. Mission 211 found us out again on the 10th and having as our assigned MPI a RR VIADUCT ½ mile west of ARNSBURG, GERMANY, which carried main double-track over the Ruhr River and was 400 feet long. This was in plan to immobilize [the] Ruhr, and this target had been hit just once before and in 10/10ths weather. Of the 29 A/C dispatched, 28 attacked the target by GH methods with unobserved results. All three squadrons had good GH runs and there is little doubt in our minds that our bomb load of 160x1000 GP’s added our share in the destruction of this important viaduct. Still hammering at the Hun’s transportation facilities, we were again out on the 12th to attack the M/Y at FRIEDBURG, an active key point in the RR system, SE of [the] Ruhr, and vital to German defenses of [the] lower section of the Rhine. LT COL O’NEILL, CAPTS QUINN and GOODFRIEND led 28 A/C over the target, bombing it by GH methods and dropping 1028x100 GP’s and 44 M-17’s with unobserved results. Ho hum, this instrument bombing does get a bit boring; not only for the combat men, but for this historian as well. On the 15th we were given a most important target, one which, if devastated, would result in removing some of the top brains of the German General Staff. This was considered one of the top priority targets left. Our victim to be was the GERMAN GENERAL STAFF HEADQUARTERS at ZOSSEN, and was assigned to both the 1ST and 2ND Air Divisions of the Eighth Air Force upon special request. This rat nest was originally planned to house the entire staff of officer’s underground, but due to organizational growth, a sizable portion of the HQ is currently situated above the ground. An effective attack will disrupt and disorganize administration of the German General Staff. The honors of leadership went to MAJOR BETZOLD and LTS MITCHELL and CHIMPLES, and under this fine leadership, 24 A/C bombed the primary and 2 A/C bombed DIEPHOLZ all under visual conditions. Although our bursts were plotted south of our MPI, we did a fine job of busting up barracks, mess halls, etc., and materially aided the other groups and wings in this all out successful attack on this highly important target. Our bombs dropped were 288x250 GP’s and 84 M-17’s. In later reports from HQ VIII AF, bombing results by all groups and wings on this target were estimated as good as the camp was virtually demolished, thus making it imperative for the Nazis to find a new hole and new blood for the general staff. Due to heavy cloud cover on the 17th we were forced to hit a secondary target instead of the assigned primary. Our assigned primary was the KORTING BROTHERS TANK WORKS in HANOVER, and the secondary was the HANOMAG TANK WORKS in the same town. Our H2X MPI was the undamaged portion of the plant. Twenty-six of our A/C dropped 282x500 GP’s under the leadership of LT COL WILLIAMSON, MAJOR KUHN and CAPT GOODFRIEND with unobserved results as SAVs showed complete undercast. However, we did have a good straight bomb run with the H2X operator making only one minor correction from the course given him by the navigator. This brought our mission record up to 215, and that is nothing to sneeze at in one year and 15 days operational time. “BIG B” was to feel the weight of the entire VIII AF on the 18th, and the 458th was going along for the big show. Our part in this gigantic operation was to attack the ARMAMENT AND HEAVY ORDNANCE FACTORY making AA guns, bombs, ammo and employing about 20,000 people and had not been hit since early 1944. The victim was located in the TEGEL AREA. CAPT QUINN and LTS HELFRECHT and MITCHELL were chosen to lead our formation and placed 29 A/C over the target, dropping 1298 M47 IB’s with the following results: SAV indicate concentration of IB’s on MPI and vicinity as well as 2000 feet south of MPI. Those of us who saw the newsreel on this attack were proud of being a member of the greatest Air Force in the world, and helping in our own small way to end this conflict started by those who were getting back 1000 fold what they attempted to give the Allied countries. On the 19th we were again favored with a visual run and proved that the eyes of the bombardiers had not lost their old keenness after such a prolonged run of instrument bombing. Our hapless victim for the day was the A/F at LEIPHEIM, the first A/F we had attacked in quite some time. This was the 3rd largest producer of the jet ME-262’s, therefore warranted some good bombing results. MAJOR LaVELL, CAPTS SIMES [right] and POLLIARD led 28 A/C over the target dropping 96x500 GP’s and 178 M-17’s by visual methods with excellent results. Crews reported good to excellent results and SAV’s show incendiaries hitting in the target area with large part of pattern around MPI. GP’s also [fell] around MPI and severing part of the runway. And how’s this for getting them within the 2000 foot circle: lead squadron 100%, 2nd squadron 80%, and the 3rd – 97%. Boy, that is bombing accuracy anyway one wants to look at it. Now give us a few more visual runs and let us show what we can accomplish. Although we did have a visual run on our next mission on the 20th, our results were not too good. Looks like we ought to swallow the statement contained in the last sentence of the previous paragraph, but we won’t as we know what is coming up on later missions. However, we will admit our results on the OIL REFINERY at HEMINGSTEDT were not too hot. We sent over one squadron of 10 A/C led by MAJOR BREEDING, dropped 106x500 GP’s with the following results: photo coverage reveals bombs hit about 2500 feet to right and beyond assigned MPI. Our only excuse was the heavy ground haze which made it difficult to pick up the target. On the 21st we vindicated ourselves for the 20th’s bombings by doing an excellent job on the A/F at HESEPE, NNW of OSNABRUCK. This effort was in accordance with VIII AF policy of now attacking airfields in operation of Jet A/C. The general purpose was to block runways and frag areas, to cut down flak, [and] to facilitate strafing by our fighters who would follow us in. Thirty-four A/C led by MAJOR PHILLIP and LTS WILLIAMS, HATHORN and HOFFMAN dropped 1449x100 GP bombs with from very good to excellent results. 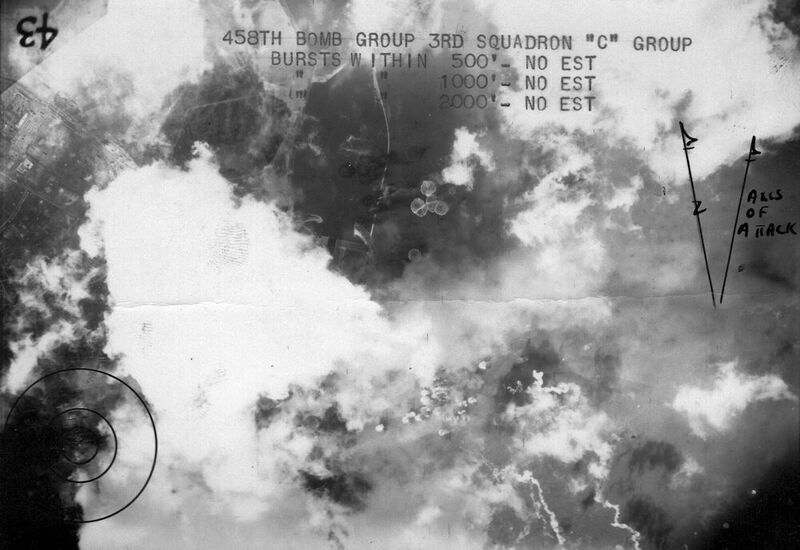 Our photo interpretation shows that the lead squadron dropped 95% within the 2000 foot marker with the 2nd [squadron] garnering 52% and the 3rd 64%. A tribute to the keen airmanship showed by the combat boys. Still in conjunction with Jet A/C field destruction, we were again airborne on the 22nd with an attack on the A/F at KITZINGEN near WURZBURG. MAJOR RUE, LTS POLLIARD and DAHM led 28 A/C over the target, bombed visually dropping 816x100 GP’s and 90x500 GP’s with excellent results. Once again we racked up an impressive exhibit with our lead squadron dropping 22% within the 2000 foot circle, the 2nd – 85% and the third with a perfect score of 100%. So you see, we won’t have to eat our statement of giving us visual bombing [sic] and see what we could accomplish. Deviating a bit from airfields, we were up again on the 23rd back at our old friend the M/Y at OSNABRUCK. The whole VIII AF this day was attacking the Hun’s transportation facilities, attempting to block their lines and destroy as much rolling stock as possible. Once again we were fortunate in getting a visual run, and our formation of 27 A/C led by COL HERZBERG, MAJOR LaVELL and LT HELFRECHT did a mighty fine job of pin point bombing. They dropped a total of 351x500 RDX bombs with excellent results. Computing our individual squadron scores, we found the first squadron with a perfect 100% within the 2000 foot [circle], the 2nd squadron breathing on its heels with 99%, and the 3rd not too far behind with 85%. The 24th was a two-mission day for the 458th as we placed one formation of 19 A/C led by CAPT QUINN and LT POLLIARD over the A/F at NORDHORN. This was a very active single engine airfield and again the attack was in conjunction with the policy set down by higher headquarters. 817x100 GP’s were dropped with excellent result with SAV’s showing airfield to be completely blanketed with hits. Our second mission of the day was our attack on the KIRTORF A/F. 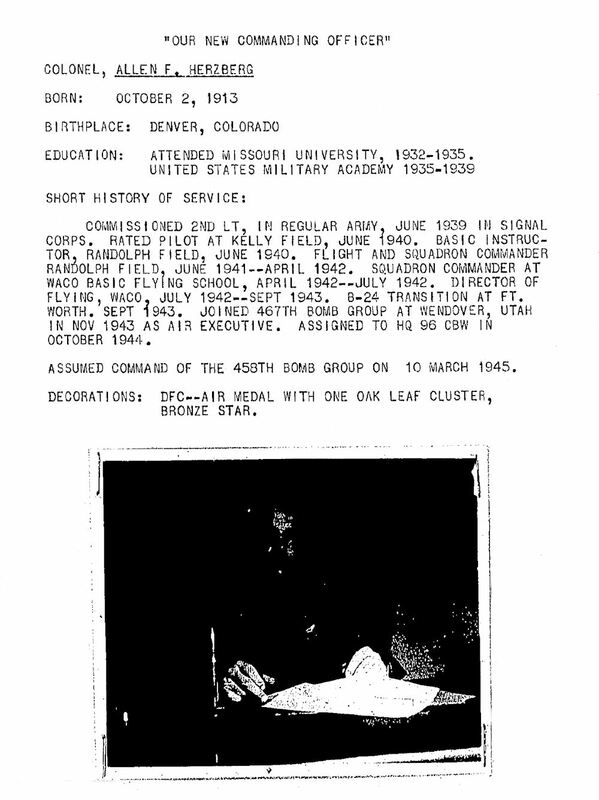 Our Command Pilots on this mission were MAJOR BETZOLD, MAJ WOODWARD, and LT HATHORN. 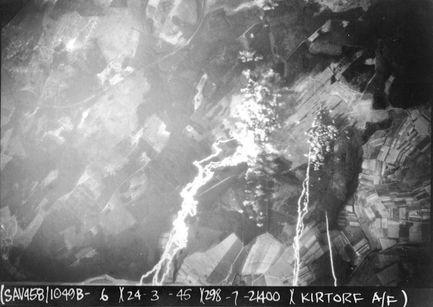 A total of 1048x100 GP’s were dropped with the following results: 18 A/C attacked KIRTORF A/F visual [left]. Crews report good to excellent results. SAV’s show major part of pattern on MPI and vicinity. 9 A/C attacked RORSHAIN A/F 5057-0915, as a last resort visually. Crews report good results. One A/C attacked HORMEDE A/F with another wing. Crew reports results good. So, when we are told to do something, you may rest assured we will do our damndest. On our fifth straight day of continuous flying we were again aloft on the 25th, and assigned as our primary target the OIL STORAGE DEPOT at HITZACKER, about 50 miles S.E. of HAMBURG. According to information received from SHAEF, both this and other similar oil depots were active in replenishing the GAF [German Air Force] or forces on the Western Front. So, a luscious morsel for the group to strike at. LT COL HOGG, CAPT GARDNER and LT DAHM were our leaders on this mission, leading 21 A/C over the target, dropping 108x250 and 288x300 GP’s visually with excellent results. Photos show our lead squadron to have a perfect 100%, no estimate on the 2nd squadron and the third with an almost perfect score of 99% within the 2000 foot circle. The only event marring an otherwise perfect record was an electrical malfunction in the lead A/C of the 2nd squadron which caused bombs to drop out 15 miles short of the target. However, the terrific pasting by the other two squadrons certainly did the job called for and we don’t think we will have to pay a return visit to HITZACKER. March 30 - SAV for Wilhemshaven (click above for larger image). Bomb bursts can be seen just below clouds in middle of photo, while sections of the harbor are visible above the cloud formation. The German Cruiser Koln sits where it sank. Its gun turrets still operational, they were used to help defend the city. 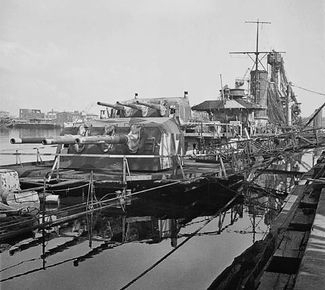 After a few days of rest which was appreciated by all personnel, we were not again operationally airborne until the 30th when we attacked the SHIPYARDS at WILHELMSHAVEN, otherwise known as the Nazi U-Boat nests. We had a large formation up this day, with 39 A/C attacking the primary under the leadership of MAJOR BREEDING, CAPT FLOYD and LTS DAHM and LANDQUIST. A total of 60x1000 GP’s and 325x500 GP’s were dropped with the following results: bombing accomplished by H2X with a visual assist. Crews report hits in harbor basin and on adjoining dock area. SAV’s which are seven tenths cloud covered show bomb pattern falling in target area, but impacts are not visible. However, later PRU (Photo Reconnaissance Unit) coverage showed the attacking forces scored excellent patterns on all assigned MPI’s, plus putting to the bottom the larger cruiser KOLN which was anchored in the harbor basin. We are pretty confident that our part played in this attack helped immeasurably in this successful attack. Our last mission of the month showed us attacking the M/Y at BRUNSWICK, but we were not fortunate in having good weather, so all bombing was accomplished with H2X equipment. MAJOR PHILLIP, and LTS HOFFMAN and WILLIAMS led 20 A/C dropping 308x500 GP’s with unobserved results. And so finished the month of March with 24 missions for the month, the second highest of our career in the ETO, only being surpassed by the month of June  when we rolled up 30 missions in 30 days. Not only is March our biggest month on A/C sorties with 681, but it is also the biggest month on tonnage dropped, as our records show 1572 tons dropped compared to 1417 tons dropped in June. The entire personnel of AAF 123 can very well be proud of their efforts in helping the group achieve these results for the month.